Jeaneane Fowler was formerly Head of Philosophy and Religious Studies at the University of Wales, Newport, and later an Honorary Research Fellow. Her publications include Hinduism: Beliefs and Practices (Choice Outstanding title, 1997); World Religions: An introduction for students (editor); and Perspectives of Reality – An introduction to the philosophy of Hinduism. The best source book on humanism that is currently available. 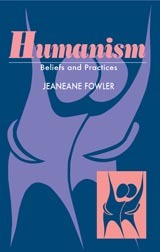 It is especially valuable because Dr Fowler not only deals with the theory of humanism, but its practical applications. She demonstrates how humanists deal with moral questions – such as equality of the sexes, education, abortion, euthanasia, genetics, etc. She also points out that humanists celebrate the rites of passage – all contributing to shared experiences within communities. I am glad to recommend this unique and comprehensive work. The complexities of the term "Humanism"
Can it be proved that God exists? Why do humans need religion? Is the concept of equality rational? A sympathetic, comprehensive statement of humanism, exploring both its philosophical basis and its practical application living one’s life.